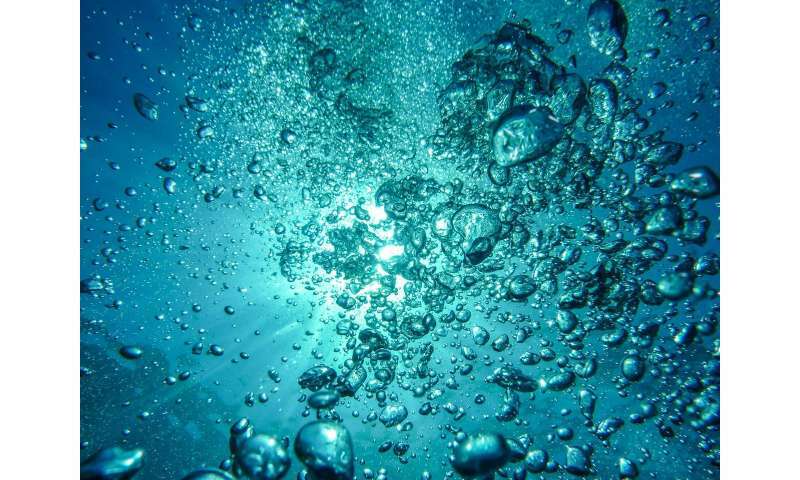 A team of researchers from Yonsei University in Korea and Hokkaido University in Japan, has developed a metamaterial device that allows for much better than normal sound transfer between water and air. In their paper published in Physical Review Letters, the researchers describe their device, how it works and the ways it needs to be improved. Normally, it is nearly impossible to hear underwater sound from the air above—the same is true in reverse. This is because of acoustic impedance forming a sound barrier. Sound waves bounce off the barrier, preventing them from escaping. In this new effort, the researchers applied a metamaterial device (a metasurface) to the barrier that essentially serves as a tunnel between the water and the air, allowing more sound waves to pass through. The metamaterial device the team built consists of a cylindrical metal outer shell that looks a lot like a car tire rim. It has a rubber segmented membrane at its center with a weight to keep it taut. The device floats on the water. A person hovering over it in the air can hear sounds from below the surface that are not normally audible. Normally, just 0.1 or 0.2 percent of sound waves can penetrate the water/air barrier, but in testing their new device, the researchers found that it increased sound transmission to the extent that up to 30 percent of waves got through. The device could theoretically be used to help with human communications between people in the water and those above the surface, or to listen to sea creatures stirring below—but it has two major drawbacks that will likely limit its use. The first is that it is only able to pass through sounds waves that come from directly below it—diagonal waves are still bounced away. The second problem is that it only works for a certain limited range of frequencies—from approximately 600 to 800 Hz. Potentially, both problems could be solved by building arrays of individual devices that could pass different frequencies and enough of them to cover a large area. Wouldn't it be almost as easy to use a microphone, speaker, amplifier and hydrophone? The hydrophone would take care of the impedance translation and the amplifier could be made to work bidirectionally and could boost the signal by tens of dB. While not quite as cheap as a hula hoop with a rubber membrane stretched in the middle, it would be almost as convenient, and I would think that it would perform a lot better. Use a bigger, dished frame like 'steel drum', so different size 'windows', angled, too ? ?